Sonny Terry was born Sanders Terrell in a rural area near Greensboro, Georgia. His father, Ruben Terrell, played the harmonica in the evening to relax. Each night he put the instrument away on a high shelf, well out of reach of young Sonny. But when he left for work for the day, Sonny climbed up and got the harmonica down to try it out. One day he didn't put it back just as his father had left it, and when his father noticed, he asked Sonny if he'd been playing. Sonny's mother told his father that he played a tune for her every day, and his father decided to teach him how to "really play." From his father, Sonny learned to play blues and to mimic on the harmonica the sounds of far-away trains and the baying of hounds. When Sonny was 11 and again when he was 16 years old, he had accidents that resulted in the loss of vision in both eyes. After the second accident, he started playing harmonica in local churches and dance halls. When he was 19, he began to tour with traveling medicine shows, moving from town to town, supporting himself as best he could. By the early 1930s he was living in Durham, North Carolina, where he played at tobacco warehouses, fish fries and house parties and on the streets with two blind guitarists, Reverend Gary Davis and "Blind Boy" Fuller. He made several 78 rpm recordings with Fuller on the Vocalion label that were popular among rural blacks across the South. In 1938, he was invited by John Hammond to play at Carnegie Hall in the legendary "Spirituals to Swing" concert. After Fuller died in 1941, Terry teamed up with guitarist Brownie McGhee, and the two men played and toured together for the next forty years. They joined the Great Migration to New York City and attained considerable success, recording prolifically and entertaining at private parties, on radio programs and in stage shows. They appeared in the casts of the Broadway shows Finian's Rainbow (1947-1948) and Cat on a Hot Tin Roof (1955-1957). In the late 1950s, they became part of what is now called the folk revival and were invited to participate in numerous European tours. For a time, Terry lived in an old loft building where Woody Guthrie, Burl Ives and other popular singers stayed. About 1970, Terry and McGhee split up over personality conflicts and tensions related to their respective musical careers, though they did reunite on occasion over the years. Terry began playing solo harmonica, and for a brief period he led his own small band. Terry was renowned for his virtuosity in playing the harmonica. He used a "cross-note" technique, playing in a key other than the key of the diatonic harmonica, and was especially talented in creating special effects, including train whistles, animal cries and vocal moans. He sometimes sang while he played, and, by controlling his breath and cupping his hands over the harmonica, he was able to modulate from key to key, blending the musical pitch and slurring notes. Ball, Tom. 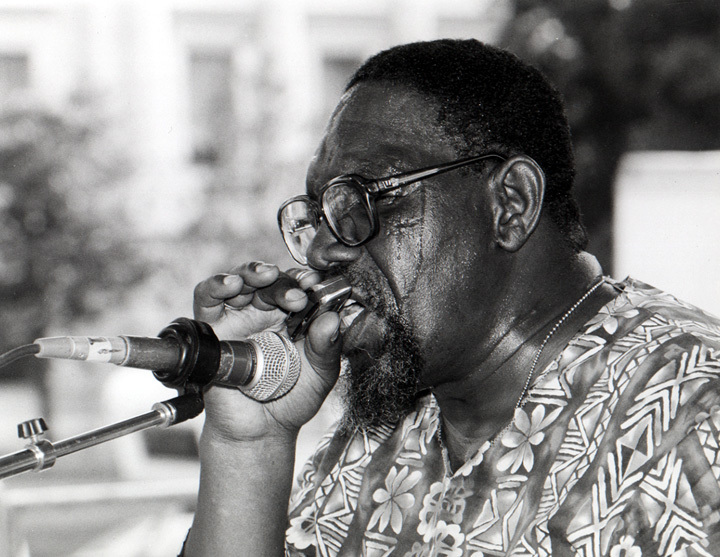 Sonny Terry Licks for Blues Harmonica, 50 Famous Licks. Anaheim, California: Centerstream Publishing, 1995. Oliver, Paul. "Sonny Terry." In The New Grove Dictionary of American Music. New York: Grove Dictionaries, 1986. Terry, Sonny, Kent Cooper and Fred Palmer. Sonny Terry's Country Blues Harmonica. New York: Music Sales Corporation, 1975. Terry, Sonny, and Kent Cooper. The Harp Styles of Sonny Terry. New York. 1957. Terry, Sonny. The Folkways Years, 1944-1963. Smithsonian Folkways 40033. _______. Gotta Move Your Baby. Prestige P7831. _______. On the Road. Smithsonian Folkways 2369. 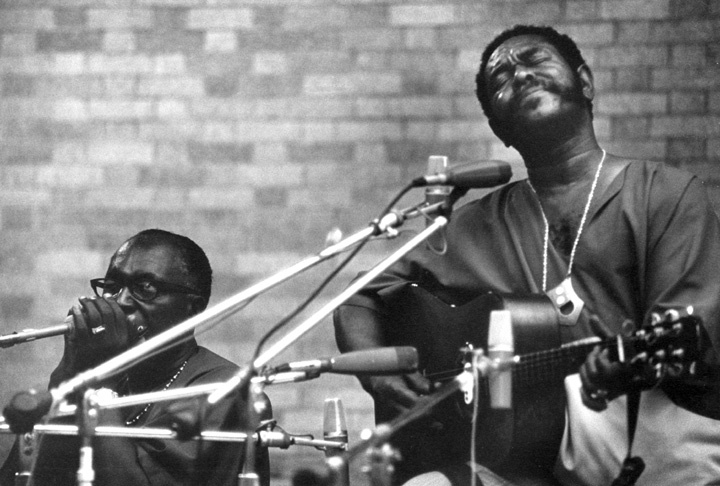 Terry, Sonny, with Brownie McGhee. Brownie McGhee and Sonny Terry. Smithsonian Folkways 40011. _______. Whoopin' the Blues, 1958-1974. Vestapol VEST 13057. Dimensions in Black. Videotape, 59 minutes. Produced by KPBS, San Diego, California: PBS Video. A Musical Journey: The Films of Pete Toshi and Dan Seeger, 1957-1964. Vestapol Productions 13042. Distributed by Rounder Records, 1996.